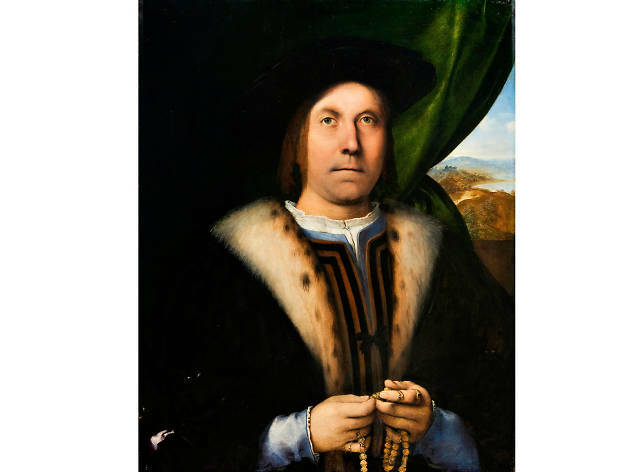 Centuries before television screens brought high-definition into our homes – and beauty experts promised to recreate the effect on our brows and cheeks – Lorenzo Lotto was ramping up the crystalline clarity of everything he recorded in paint. 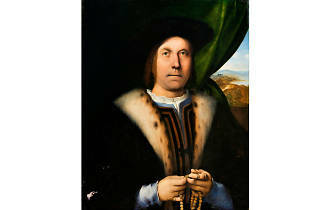 Working at the same time as Titian, Lotto’s portraits are notable for showing people from middle-class backgrounds (clerics, merchants, artisans, etc) as well as the moneyed aristocracy. They’re now the subject of a small but perfectly formed (and free) exhibition at The National Gallery and the devil, as they say, is all in the detail. Every last part of these images has been meticulously, painstakingly worked on. A tiny memento mori skull peeks out from a pile of rose petals, while a man’s hand – the faintest line of dirt just visible under a fingernail – rests next to it, the jewel on his ring a swirl of Milky Way blues. And in another, the fine text of a physician’s book is visible on the part-open pages, as it also is on each piece of paperwork piled on a desk. Lotto is credited with giving his sitters surprisingly modern qualities, meaning they appear to have personality and something going on between the ears. They also look directly out at the viewer, with eyes you can be certain would follow you around a room. And again, it’s Lotto’s zoomed-in detail that adds to the hyper-realism of the people in the pictures. Greyscale veins run across the forehead of a Dominican friar, while in another image each individual wisp of a ginger beard is present and correct. The only slight hint of airbrushing is in the snow-white complexions, with perfect rosy circles of blush, shared by all of Lotto’s female subjects. But if there’s one thing apart from faces that Lotto gets right, it’s fabric. Billowing sleeves and endlessly flowing dresses are made up from a mass of pleats, folds and ripples. It’s luxury writ large, status-signifying fashion in the lush scarlet, olive and azure made famous by Italian painters of the time. Confusingly, these colours completely lose their vividness in reproduction. So forget Googling and go see for yourself HD done the Renaissance way.